본 연구의 목적은 학교폭력 잠재집단이 각 유형별 피해경험과 가해경험에 따라 어떻게 나눠지는지 살펴보고, 이러한 잠재집단 분류에 개인과 학교 요인들이 미치는 영향을 검증하는 것이다. 이를 위해 서울교육종단연구(SELS2010)의 초등학교 4학년 패널의 5차 자료 중 학교폭력을 한번 이상 경험한 학생 2,195명의 학교폭력 피해 및 가해경험에 대해 다층 잠재프로파일 모형(multilevel latent profile model)을 적용하여 분석하였다. 분석 결과, 학교폭력 가해 및 피해경험을 종류별, 수준별로 모두 고려하였을 때 가해피해 고수준집단(1.7%), 가해위주집단(2.1%), 피해위주집단(3.7%), 언어적 폭력경험집단(92.5%)의 4가지의 집단으로 분류되었다. 영향요인 검증 결과, 학생수준에서 성별, 탄력성, 자기통제력, 친구관계, 부모자녀관계가 유의하게 나타났고, 학교수준에서 교사학생관계, 학교폭력 예방교육, 학교 내 성비가 유의하게 나타났다. 본 연구는 학교폭력 가해와 피해 경험을 모두 포함하여 빈도별, 유형별로 집단을 한 번에 분류하여 이론적 논의를 확장하였고, 다층자료임을 반영하여 개인수준과 학교수준의 영향요인을 동시에 검증했다는 점에서 의의가 있다. The purposes of this study are to identify the latent classes of school violence depending on bullying and victimized experience by type and the influences of individual-level and school-level variables on determining these latent profiles. 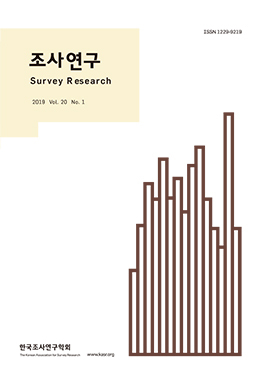 For these research goals, the present study utilized data from the Seoul Education Longitudinal Study(SELS) 5th wave, containing data from 2,195 middle school students who experienced school violences more than once. Multilevel latent profile models were applied to examine school violence among students. Our results indicated that there were four latent classes; high-level bullying and victimized group (1.7%), mainly bullying group(2.1%), mainly victimized group(3.7%), verbal bullying and victimized group(92.5%). Gender, resilience, selfcontrol, peer relationship, parental relationship were significant determinants of the latent profiles at student level. Teacher-student relationships, school violence prevention, gender ratio of school were significant determinants of the latent profiles at school level. The present study contributed to extending theoretical discussions by classifying students into groups based on frequency and different forms of bullying and victimization. Moreover, this study examined determinants of student and school level simultaneously by dealing with multilevel data.